Owens Corning® roofing products work best only when installed by a Preferred Contractor. Only select roofers in the brand’s extensive network earn this designation, a prestigious distinction that separates the best from the rest. Unlicensed roofers don’t qualify for this certification. As a local extension of the Owens Corning brand, this leading manufacturer doesn’t allow just anybody to represent it to homeowners. The brand wants to make sure all of its certified roofers play by the rules. 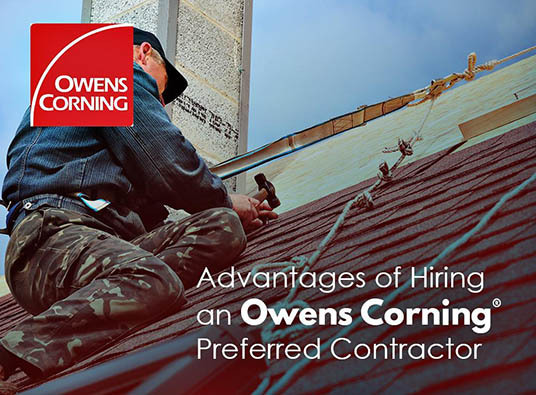 Apart from securing a legitimate license, Owens Corning requires its Preferred Contractors to carry adequate general liability and workers’ compensation coverage. This is for your protection because when you hire an uninsured contractor and someone gets hurt on your property, you might be held accountable. Any roofer can offer Owens Corning products even when they’ve just entered the business. Roofing companies with the preferred certification, on the other hand, have been plying their trade for at least two years. Considering roofing work has a steep learning curve, choosing someone inexperienced is a major gamble. Preferred Contractors have exclusive access to the Total Protection Roofing System™ Module, which is essential to deliver flawless work. Without getting a formal education, workmanship errors are bound to happen, which would most likely lead to premature roof failures. Hiring a Preferred Contractor gives you the unique privilege to upgrade to Owens Corning’s higher levels of roofing warranty. For just a little extra, you can enjoy longer insurance against material defects for the entire roofing system plus 10-year workmanship coverage. Choosing a Preferred Contractor over an uncertified company for your Owens Corning roof replacement makes sense any way you cut it. To talk about your roofing needs in Michigan, call us at (844) 688-9632 to schedule your FREE, in-home consultation.